Two remarkable, influential men died yesterday, although the news media have devoted disproportionate coverage to just one of the deaths. By now everybody knows that Steve Jobs has died. It is plastered across the front page at our newspaper of record. Jobs was my age, an incredibly creative person who designed and branded toys that we all like. (I write this on my MacBook Pro. I've gone from being a skeptic to being a user. Not a convert.) 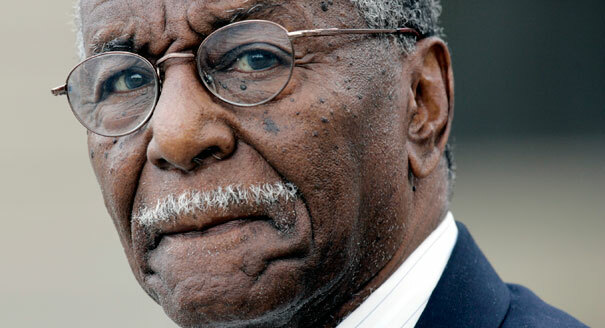 Jobs's passing - tragic because premature - has more or less totally over-shadowed the death yesterday of Fred Shuttlesworth, pictured above. Shuttlesworth was a civil rights leader in the 1950s and 1960s - a practitioner of non-violent direct action in the deep South of the US, who spoke and stood for our putative ideals even as his actions placed himself in mortal danger. He helped bring us freedom and equality and the sort of self-respect that comes from embracing rather than simply mouthing our deepest principles. His legacy endures, but his task is ongoing. Our largest deficit is not fiscal, it is a deficit of freedom and equality. That should be front page news too. I passed the Apple store in San Francisco today, replete with flowers and post-its in memory of Steve Jobs, and my stomach felt more than a trifle queasy. One of the leading members of the Civil Rights movement who risked life and limb repeatedly, died- and hardly a whisper in the media; a man who simply refused to live a life where segregation was the norm. Meanwhile, a guy who made pretty machines for those who could afford them was mourned as a true "visionary."